I've heard that moving every once in a while is good for you, so I've decided to move to another part of our digital universe. I hope you'll enjoy it as much as I do. Welcome over! Oh, and bring your knitting. Thanks for your support regarding the sleeve mishap, guys! 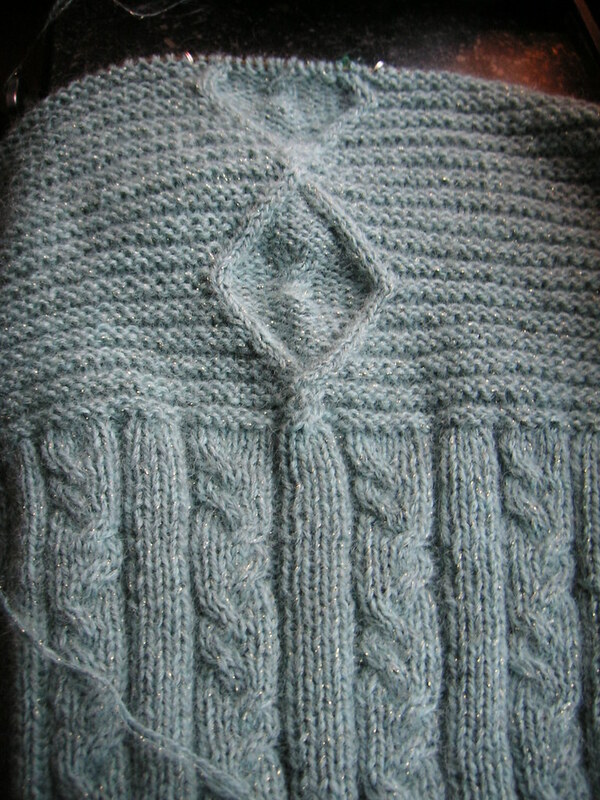 Linn: yes, the armhole is as it should be, so there seems to be no mistakes in the front and back patterns. And there really is a fourth reason, too: I remembered that knitting is something I do for fun. As soon as it annoys me I need to bring some enjoyment into it again. A good recipe for that is to put the annoying bits to the side for a while and do something else. That sure is a pretty yarn. And it's wool. I am annoyed. I am more than annoyed. I am beyond annoyed! Here I am, back finished, front finished. 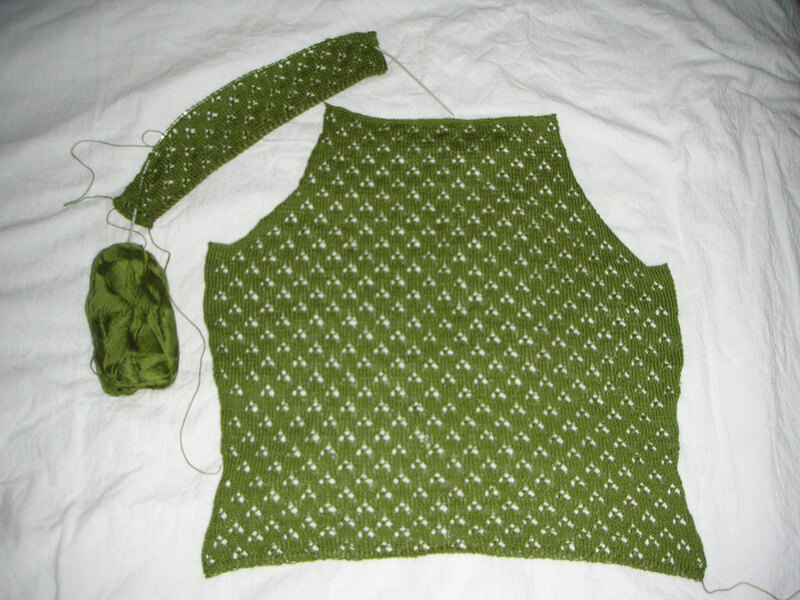 I cast on on for a simple short sleeve. 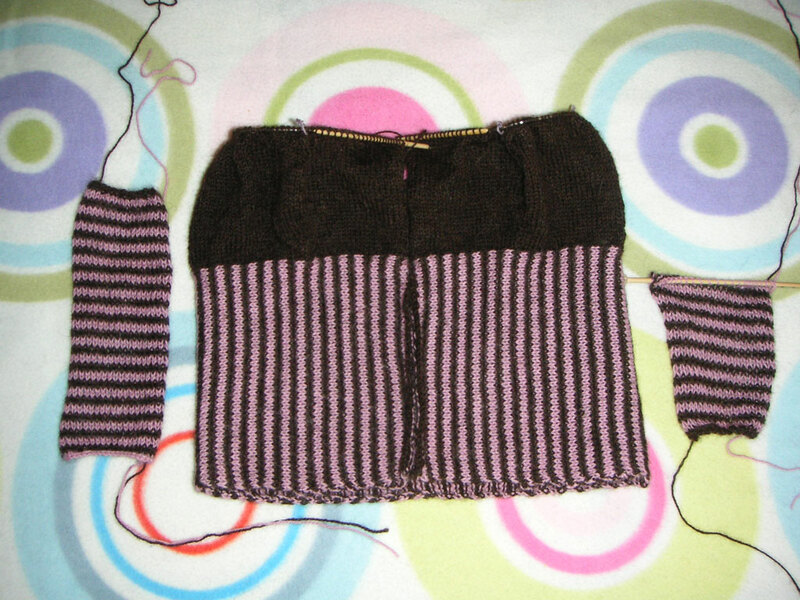 And end up with... a very odd looking and way too small sleeve! And before you say ANYTHING: I've triple checked that I've followed the pattern correctly. And, yes, I've checked Rowan's webpage and there is no errata. And not only that it's blooming small, it looks really, really weird. And yes, I DID follow the pattern correctly (you see my need to make it clear that this was not my fault?). When something like this normally happens when knitting, I just throw the knitting into a crumpled up ball and curse like a pirate, but this time I've decided that I. Am. Going. To. Finish. The. Damn. Thing. and not give up. Strangely shaped sleeve. And what's up with that cast off edge? So, I've cast on for another sleeve, using a larger size from the pattern (the first sleeve didn't even fit around my upper arm...) and I'm going to do some serious modifications to the shape of it this time. 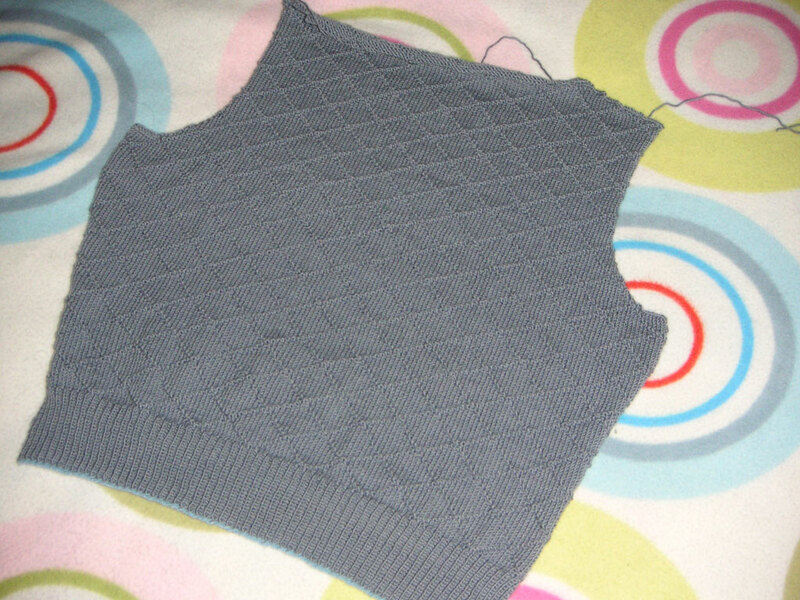 I do want this horrible top to be finished now, because I'm fed up with it. I started this project sometime this spring. I like trying new things in general, and getting my hands on a new yarn is always exciting. I prefer natural fibres, and this one is really not an exception. Bamboo yarns are all of a sudden in abundance and I like the idea of a yarn that has many good qualities and that is also ecological. Interweave Knits had an article in the Spring 2007 edition about bamboo yarns which was really interesting. 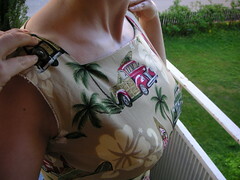 But anyway, I think the result will be fine, I hope I'll get a chance to wear this little top a lot this summer. 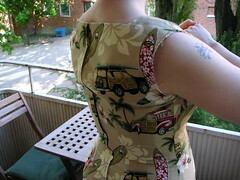 The back is finished and I'm about to complete the front as well, which leaves the sleeves and the right front piece. I will not use ribbons to close the opening with, I'll try to find some nice buttons instead. Don't forget: tomorrow is World Wide Knit In Public Day! 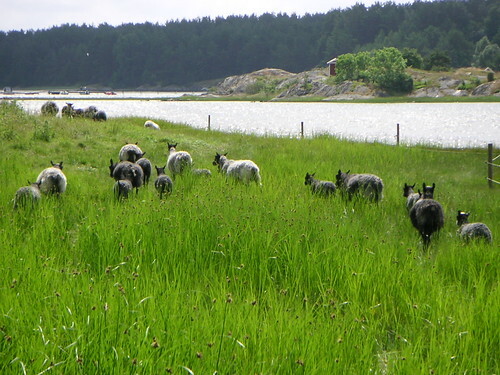 If you happen to be in Stockholm, meet up with other knitters at Mariatorget from around noon. Read more about it over at the STHLM knitters blog. Something resembling a dress is actually coming together! I still have the sleeves and the hemline to do. When I tried it on yesterday I realized that there is a not so attractive crease on the back and the front is slouching a bit, so I'll have to take off probably an inch over the shoulders. 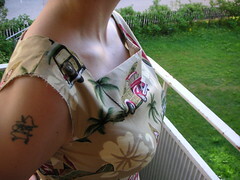 Which means I have to modify the sleeves too, but I'm not too worried about that. Spring has been unusually warm here in Stockholm, and today it's practically summer outside, at least if you look at the temperature. A horrible discovery at this time of the year is of course one's lack of a nice summer wardrobe. Sure there's the stuff you bought last year. 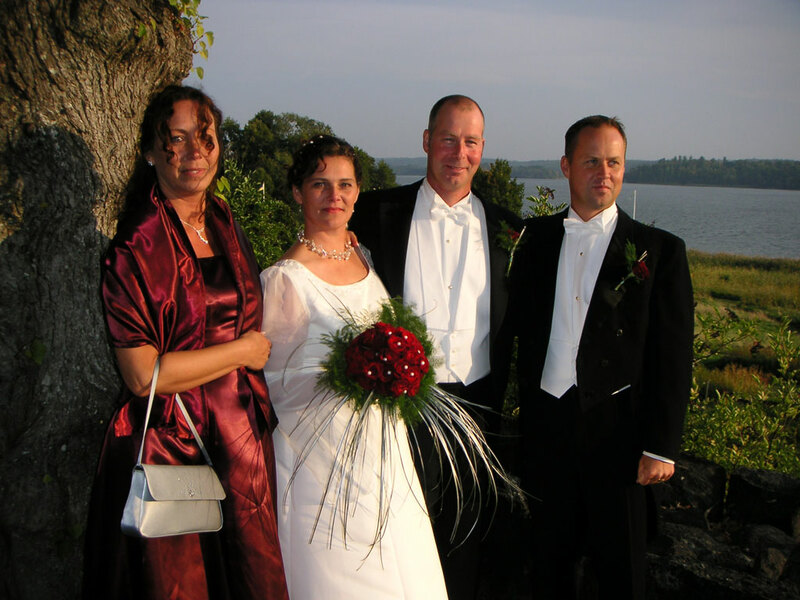 Or was it ten years ago? Anyway I'm in serious need of a wardrobe makeover. Pimp my wardrobe, so to speak. For several reasons I really don't have the means at the moment to go on an uncontrolled shopping spree, which means I have to be more creative than usual. But don't worry, folks, I have an idea! Not so original, though, but my plan is to do something with all those patterns I'm collecting and my humongous fabric stash and start whipping up some new and sazzy outfits! To me summer speaks dresses, dresses, dresses and the odd skirt. And to make this plan work even better is the fact that hopefully by this weekend I'll have a brand new workplace in my apartment where I can permanetly keep my sewing machine ready. No more stowing it away! I'll take a photo when it's all set up. Anyway, I'm planning my first sewing project in ages even as we speak (the last one was the dress for my sister's bridesmaid)! I borrowed a bunch of patterns from my friend Eva, and the one I'm planning is from one of those. I have the fabric to go with it, but no photo of it as yet. 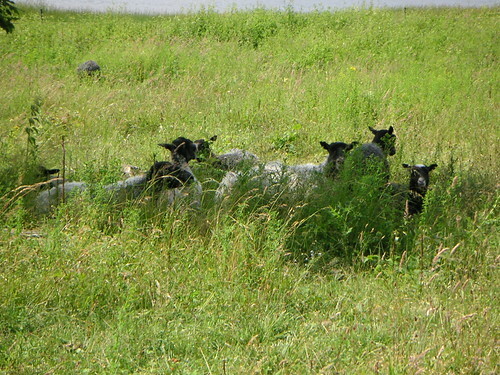 And don't forget my plans from last summer, hopefully I will se them realised soon too! 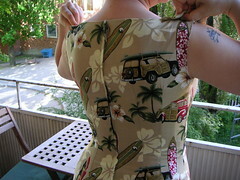 Here's the dress I'm gonne make. It's the one on the right with a short sleeve. And I found this lovely blog called "Sew Retro" which I'll definitely join! Summer, here I come! 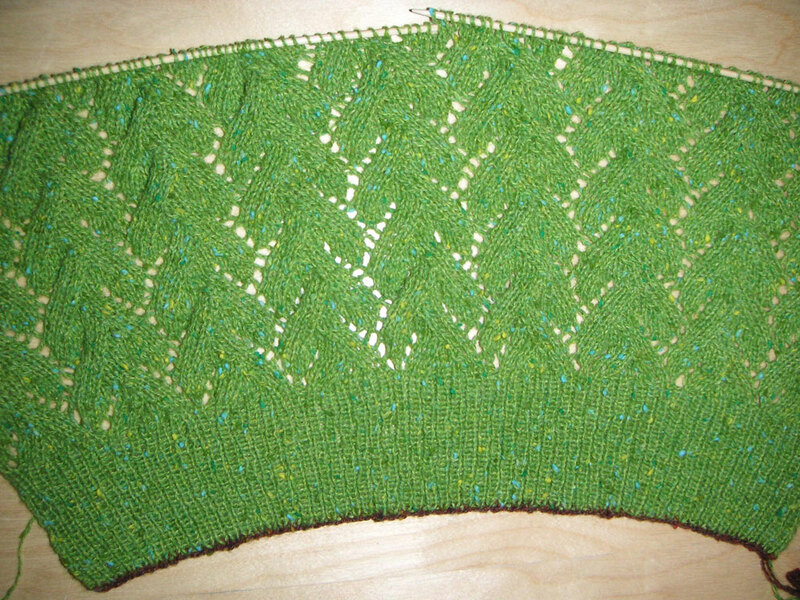 But don't worry, this does not mean that I have abandoned my knitting, oh, no, I'm still working on those cute knee-high socks and I've started a nice cool summer top for those hot summer days. Pictures to come. The preview is up! And Swedish knitter and DoRedo guru Katarina Brieditis is one of the designers in this issue, way to go! Take a look HERE. I didn't manage to tape it, but here's a photo of the event. Knitting on MTV. Darin and me knitting. Surreal.